Job search sites are housed in this category, including those serving people who are seeking employment, such as job databases, job exchanges, job listings, and other sites for jobseekers. Social media is changing the world that we live in everyday. While it used to be difficult keeping in touch with friends, family, peers, and colleagues, it is now as simple as the click of a button to connect with someone from your life. People have the ability to befriend, and reconnect with anyone that they have ever met throughout the course of their lives and not even have to get up from their desk. The world is at your fingertips with the utilization of social media for many aspects in your life; however, a relatively new way that social media is being utilized is for the advancement or beginning of new careers through accessing information through your social media network. The first progression of the job search process going online was that companies would post their job openings on their websites. Then companies created portals so that people could apply to jobs using the online facility. 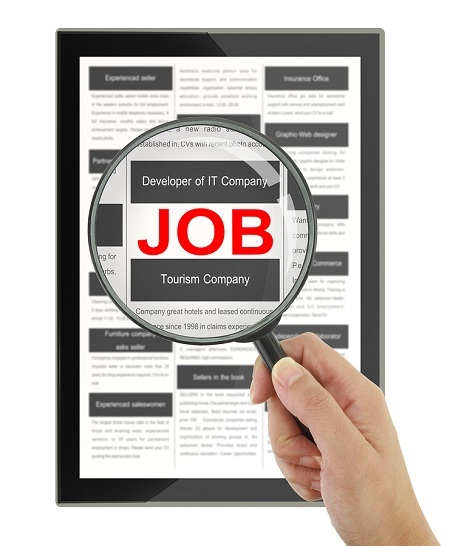 Next came the job search websites where companies can post their job openings to the website. And now there are social media sites where people can build an online resume and work portfolio and connect with other business professionals in an effort to advance their careers. People are able to advertise their skills and abilities through the social aspect of the social media sites, and then advance professionally through the networking part of the sites. Typically on social media sites that are geared toward advertising job openings to interested individuals there will be a separate section of the site that is dedicated to the job search. In general you will be able to search for the company and look at the other people who work there and build an opinion on the company and if you think that the organization in general would be a good fit for the next step in your career; however, there will traditionally be a "jobs" tab that you can select. Once you move to the "jobs" section of the social media site you will be able to search for specific criteria that will help you to narrow down your search. You will be able to filter by job type, location, part time vs. full time, etc. This will help you focus your search on only jobs that you would actually consider, instead of wasting your time filling out a hundred applications for jobs that you may or may not actually take if given the opportunity. Why is it More Beneficial to Find a Job Through Social Media than Other Sources? Many people wonder why they would apply through a social media site instead of the company�s website directly and if this is really more effective than other more traditional methods. Well, applying for jobs through social media outlets is quickly becoming a traditional method for people to apply for a new job. If you think about it rationally, if you have a job open that you were hiring for, would you spend a lot of your time interviewing a bunch of candidates that you did not have any connection with, or would you interview someone that was referred to you by a reliable source? It is a simple and honest answer for most people: they would sooner tap into their professional network than hire a complete stranger. This is why social media networking is so important. Many people build their profiles for social reasons up front, and then end up tailoring their website to exhibit their professional qualities as well. This is not the worst idea. Starting your network on a non-threatening friendly and social level, building rapport and trust, and then slowly making the relationships more professional seems to be a very effective method. People work with people that they trust. If you can build trust within your professional network then you are in a good place to build business, and find a new career when it is time for the next step on your career path. If you are looking for a new job then you would be wise to tap in to your social media network to find the next step on your career path. By Richard McMunn. Richard is the author of this post and owner of How2become.com, the UK's leading training and recruitment specialist for careers. The focus is on providing applicants with the knowledge they need to pass any selection processes. The site currently offers over 140 different titles. You can also engage with How2become on Facebook. International employment directory of world-wide top job sites. 2200 selected and reviewed career resources in 190 countries. Starting point for international jobs, overseas jobs and work abroad job searches. Search jobs and post job applications from non-professional to professional titles. Includes complete company profiles, resume builder, job search tools and career advice. Allows job seekers to submit online applications and view various job boards. Includes an office locator, career seeker resources, and a section for businesses/employers. Provides access to thousands of great jobs in Canada in one convenient location. Allows one to post a resume, search for jobs in Canada and apply to jobs in Canada. Provides a job database search able by industry, location and function. Includes a resume/cover letter builder, career news and advice, interview guidelines and an employer directory. Provides entry level jobs and internships search for college students and recent graduates. Includes career planning and information, resume and cover letter writing guidelines and tips, interview preparation, salary information, job videos, employer information and resources for college career centers. A searchable database that provides the widest selection of full and part time jobs on a wide range of professions from world renowned employers. The website also provides job seeker resources such as a job search tool to find jobs, local and online job fairs, college degree programs, training courses and others. Provides a list for various career fields and locations. You can also make an online job application through this website. The website also provides brief descriptions for each and every job. After you've completed your job application, the company will send you an e-mail with available jobs, complete job descriptions and links to the employer's details. Provides a number of job boards sorted by industry and state. Includes a job search index, career resources with scannable resume and cover letter design, employer resources, and job seeking tips. Free Resume listing for jobseekers. Free Job Listing for Employers. Provides an easy way to search for any position in the United States or Canada. The website searches the Web for postings and it can be a great tool to help you find work. The website has over a million jobs in the United States alone. You can also use this website to set up job alerts so you never miss another opportunity. Provides comprehensive information and useful resources for both job seekers and recruiters/employers. The website offers resume resources, cover letter articles and samples as well as interview questions and articleshelpful to every job seeker. The website also provides salary calculators, assessment tools and other resources. Job seekers can also search this website for careers on a variety of industries. Employers can also use this website to post jobs and look for qualified individuals. Provides online jobs and careers search, recruitment and employment solutions. Includes career resources, resume database, and company/employer information. Employment search service that lets you look for work in your community simply by entering your zip code, county, state or city. You can also submit your resume to this website and make it accessible for thousands of employers to inspect. The website has the most listings for California. Contains a vast number of job boards for a variety of industries across Asia. This website is a great destination for employers to find qualified employees and for those who are looking for a career. This website offers a wide collection of job listings, career advice, resume accounts, consulting, outsourcing, integrated recruiting solutions and other relevant information on job searching. You can also have access to the company's 24/7 live support representatives. Large India job site that helps people find jobs in Delhi, Mumbai, Chennai, and Kolkata. Provides listings of thousands of vacancies on a wide variety of industries. Includes a research library, salary calculator, directory of online degree provider, company news and career articles. Provides a central list of job openings in the Ontario Public Service. Most of the positions are based in Toronto, with some other positions elsewhere in Ontario. The website also has a section for youth and new professionals who can apply for internships and other programs to get into the public service. Website offers informatoin about jobs in Ontario by type, location, and supported languages. Offers tools to help people succeed at finding a job, including expert advice, career articles, and information about job sites. Job search engine. Search millions of jobs across the world, in Australia, China, India and other locations. Features resumes, a job bank, job postings splits and recruiting tools for headhunters, employment agencies and staffing firms. Provides a job matching site that automatically matches up employers with relevant applicants through a sophisticated profile matching software application. Allows people to search over 5 million job listings and thousands of jobs sites to find a job. Lists thousands of quality freelance, contract and consulting projects posted daily. Allows people to post a resume and apply to top freelance projects easily. Offers summer jobs and seasonal employment on camps, amusement parks, resorts, national parks, hotels, and related fields. Includes career articles and job seeking advice. This website is an employment service that provides library job listings all over Canada. You can also set up job alerts so you can learn about new Canadian library job listings as soon as they become available. The website also provides education resources for library professionals. Provides a job search index with thousands of job boards on a variety of industries. Includes a salary survey, career tips and articles, and HR videos. Contains an array of job boards for employers and job seekers. Includes a resume database, job seeker resources, daily job and resume alerts. A search engine that holds a wide selection of job postings from a wide variety of job boards, staffing agencies and large companies. No matter what industry you are looking for, there should be an entry for you in this website. Canadian job search engine with thousands of job boards on various industries. Includes career advice, articles, resume builder, salary calculator, interview dos and don'ts, and other how-to. Search for Job Search on Google, Bing, or Yahoo!